Day 1 of solitude hasn’t been so bad. Scott actually didn’t have to leave until around 11 AM so we had a lazy morning together. We ate sushi leftovers and played NHL 12 on the Playstation. I got the game for a present for Scott through some special connections at school. I knew he wanted it and the price was right so I got it. Actually it was pretty fun playing it against each other this morning, but maybe only because we were both equally bad at it. Once he gets good I probably won’t want to play any. But anyway, the commentators were funny and the graphics are pretty cool. And I (Sens) beat him (Canucks) 2-1. YEAH. Yesterday was lots of fun. My aunt and uncle came over for dinner. Rosemarie and Scott did most of the cooking, which was nice. 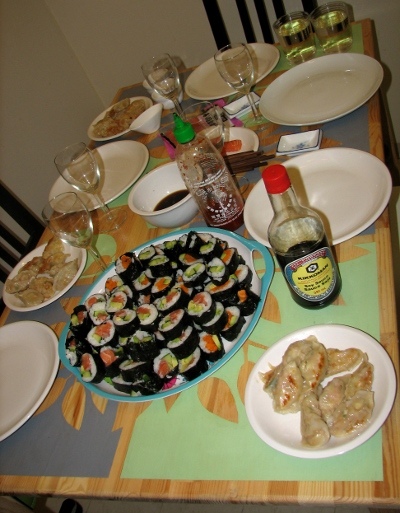 Rosemarie made pork dumplings, and I chopped up the vegetables and fish for sushi. Scott made white chocolate raspberry mini cheesecakes. Then Rosemarie rolled all the sushi and then I dropped it on the floor. We ate it anyway. Take a look at our feast! We had lots of leftovers. Fine by me!! Anyway I finished two lab reports today, which is good. I’ve still got three assignments and studying to do tomorrow. And grocery shopping. Blech. You could make your own 3D settlers game. It could be a project for the future. At least I am pretty sure your could make the 3D tiles. that would be a fun (and nerdy) project! half of that price is still a ton! but we may ask you about some expansion packs at some point!!! thanks!